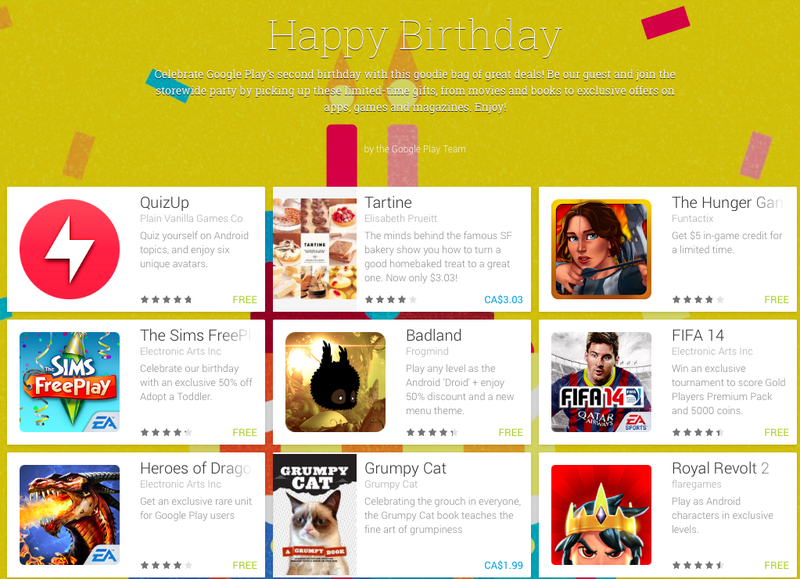 Google Play is entering into its second year of incarnation (from the Play Store) and in doing so, Google are celebrating its 2nd birthday with a bunch of exciting offers and deals to go with all the festivities. As of today, you can grab hold of a number of exciting goodies including discounts on Books, Movies, featured apps, games and much much more. Here’s an in-depth look at all the exciting stuff that Google has in store for you so head on over to Google Play and make use of this amazing offer right away. Tartine by Elisabeth Prueitt: $3.03. This offer is for a limited time period only so head on over to Google Play and avail it till it lasts. From all of us at TAP, we would like to wish Google Play a very Happy 2nd Birthday 🙂 Cheers ! !